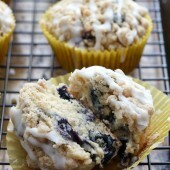 Moist blueberry muffins with a crunchy streusel topping and sweet vanilla glaze. A perfect breakfast or snack for any day of the week! Preheat oven to 350°F. Line a muffin pan with 12 liners. In a large bowl, whisk together dry streusel topping ingredients. Mix in melted butter until well incorporated and large clumps form. Transfer mixture to a small rimmed baking sheet. Break up any large pieces. Set aside. In a large bowl or stand mixer, cream together butter and sugars until light and fluffy. Add eggs, one at a time, followed by vanilla. Scrape bowl as needed. With mixer running on low, mix in cinnamon, salt, baking powder and baking soda. Alternate additions of flour and yogurt until fully combined and batter is smooth and streak free. Toss blueberries in flour to lightly coat. Add flour coated blueberries to batter and stir in by hand. Divide mixture between prepared lineres, using a large cookie scoop. Coat each scoop of batter well with streusel mixture. Bake for 18-20 minutes or until a toothpick inserted comes out clean. Cool in pan for 2-4 minutes or until easy to handle, then transfer to a wire rack to cool completely. Whisk together powdered sugar and milk. Drizzle over cooled muffins. Recipe yields roughly 12-14 muffins.